Preheat the oven to 350 degrees. Grease a 8 x 8-inch or 9 x 9-inch brownie pan and line it with a sheet of parchment, leaving some extra parchment on either side; this will help with removing the brownies. In a glass or stainless steel bowl, nestled in a saucepan with simmering water, add the butter and chocolate chips. When melted, about 5 minutes, stir until very smooth. the salt. Fold in the flour and mix just until combined. 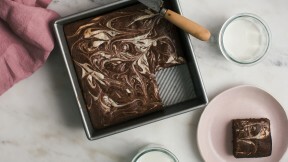 of the brownie batter and then using a skewer, run it through, creating a swirling patter. Repeat any remaining cream cheese mixture. and lift up the excess parchment. Cut the brownies into squares.